This Maple Glazed Spiral Ham rivals any store-bought glazed ham and at a fraction of the price. Save yourself some money and make your own! 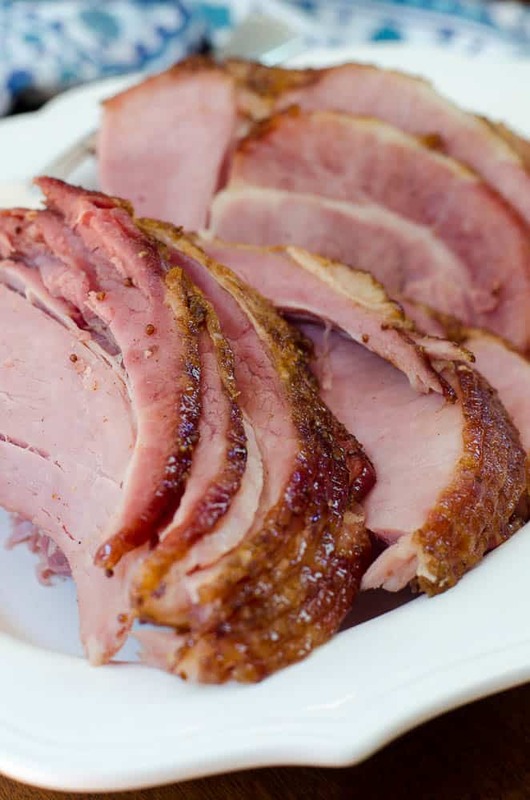 Besides being an excellent choice for a holiday meal, ham is also one of the easiest main dishes you can prepare for a large group. They come to us fully cooked so it’s just a matter of warming it through and adding a glaze. Sounds simple right? Then why is it that so many people complain about a dry, lifeless ham? The cooking method! The method I’m sharing today is how I ensure a super moist and tender result every single time. I’m also sharing a simple but insanely delicious homemade glaze to top it off. 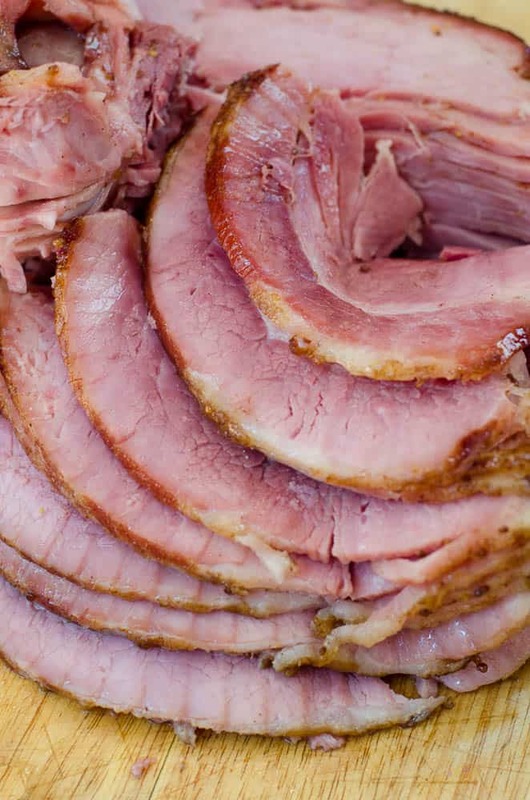 Have you ever purchased a spiral sliced, ready-to-serve ham from the “ham store”. I don’t want to name names but I think you know the one. They are delicious and RIDICULOUSLY epensive. Regardless, one year not so long ago, I thought I’d do myself a favor and grab one. I deserve a break, right? Right! I sent my husband over to retrieve the ham the day before Easter only to get the following call from him while in line. Paul: “So, I’ve been keeping track of how long it takes for them to wait on each person – and I’ve counted all of the people in line in front of me – and I’ve done the calculations (he’s smart that way). I estimate I’ll be home a week from tomorrow”. Needless to say, I told him to ditch the long line and come home. I mean, really, I can make my own ham….good grief! What’s all the fuss? 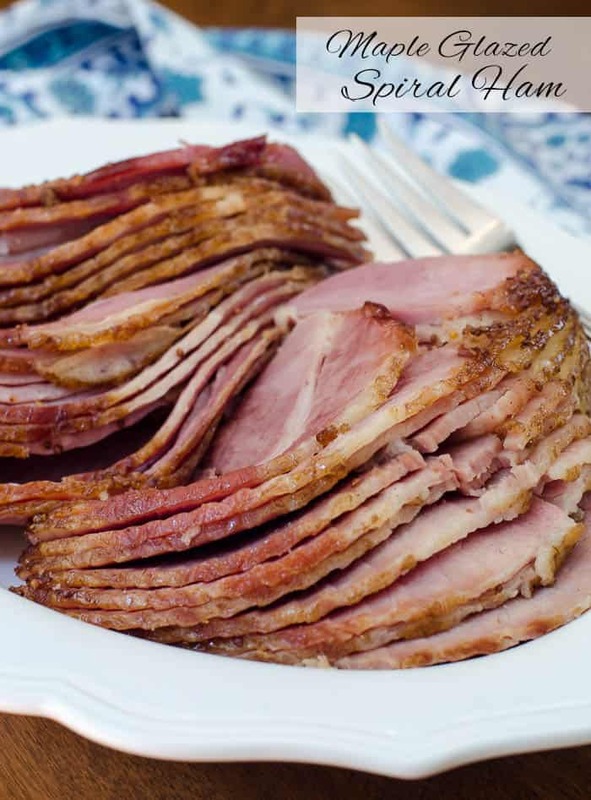 When making your own ham there are several choices available to you but make your life easy and go with a spiral sliced ham! 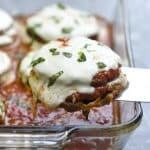 It will allow you to skip a couple of prep steps and after cooking, it will go from oven to platter in minutes. 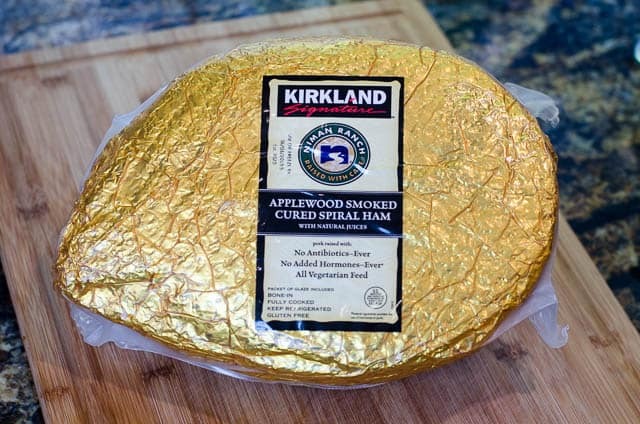 I highly recommend the Kirkland brand Applewood Smoked Cured Spiral Ham available at Costco at this time of year. I’ve used this brand for my Easter ham for the past several years and have been very happy with it. More details on this ham, including the price, are included in my Costco Haul post from last April. When deciding how large a ham you need for your group you should count on about 1/2 pound per person (this is for a bone-in ham). If you’ve got a great big buffet with lots of other heavy foods, you can go a little under this estimate. I always over-estimate because I’m all about having lots of leftovers, especially when it comes to ham. 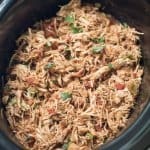 This nearly 8 pounder is perfect to feed 12 to 14 people with leftovers. 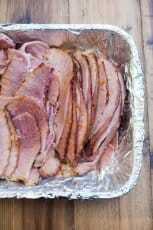 Remove the ham from the packaging and place it, cut side down, on a large piece of heavy duty foil. You need the extra thickness and sturdiness of heavy duty foil for this task so pick some up if you don’t have any on hand. 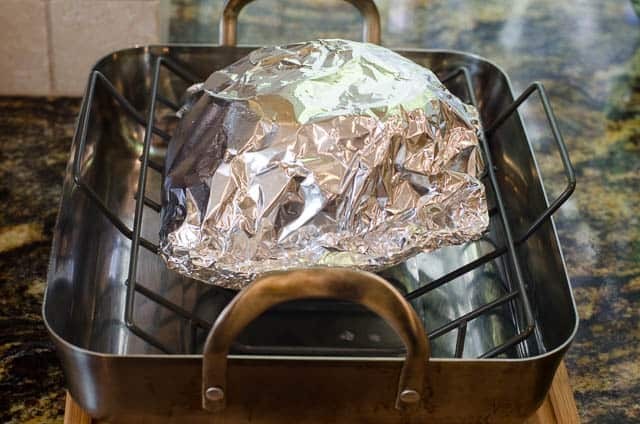 Use a piece of foil large enough to completely enclose the ham. Enclose the ham completely in the foil. Be sure the opening is on the top so you’ll have easy access when it’s time to glaze the ham. 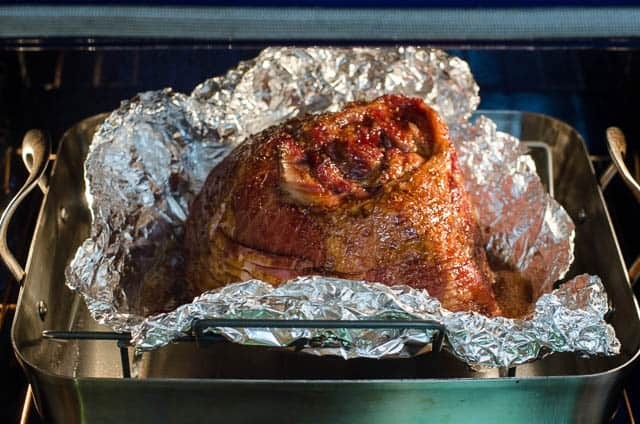 Place the foil wrapped ham on a rack in a large roasting pan. This Calphalon Stainless Steel Roaster is my baby. It’s the only roaster I use for my big holiday cooking tasks. I love it dearly. Add about 1″ of water to the bottom of the roasting pan. This will help provide a nice, moist environment in the oven for our ham. You’ll want to check it periodically while it cooks and add more water if needed. Place the roasting pan in a preheated 325 degree oven on a lower rack. Remember, the ham is fully cooked so it just takes about 10 minutes per pound to warm it through. Time to prepare the glaze. You know that glaze packet that came with the ham? You have my permission to toss it in the garbage. No hard feelings, glaze packet. We’re going to make our own super easy glaze that is going to rock your ham world. The basis for the glaze is pure maple syrup. 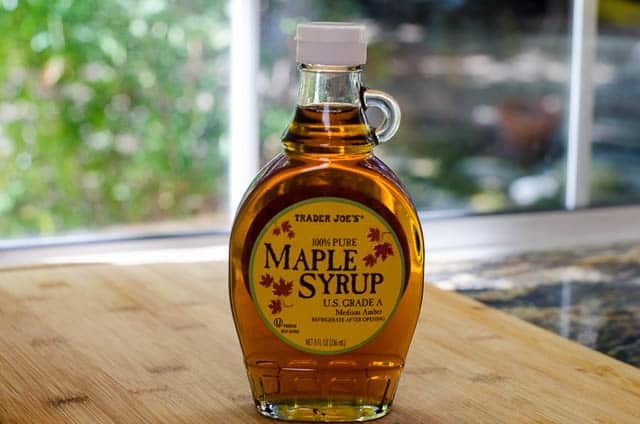 We aren’t talking Log Cabin pancake syrup here…we’re talking 100% pure , like this one from Trader Joe’s. If you’ve got a TJ’s nearby, they have a great price on the stuff in comparison to what I’ve seen at other grocery stores. 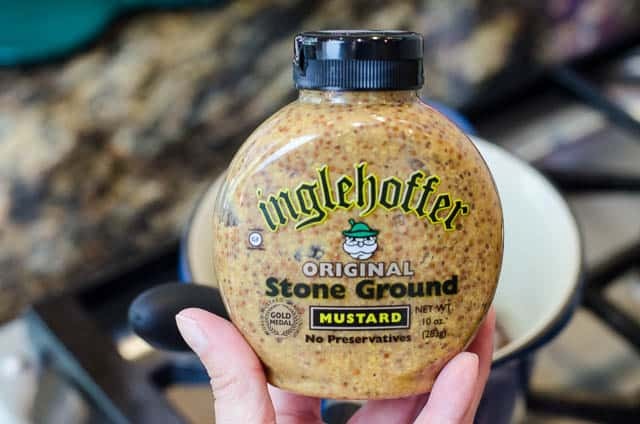 You’ll also need some stone ground mustard. I’m loving this Inglehoffer brand but there are lots of good choices out there. 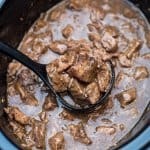 All the glaze ingredients go in a small pan over medium heat – brown sugar, pure maple syrup, a little of that stone ground mustard to balance out that sweetness, and a nice selection of warm holiday-inspired spices – cinnamon, nutmeg and a dash of ground cloves. Bring the mixture to a simmer for just a couple of minutes and remove it from the heat. Once the ham has done it’s time in the oven, remove it and increase the oven temperature to 400 degrees. 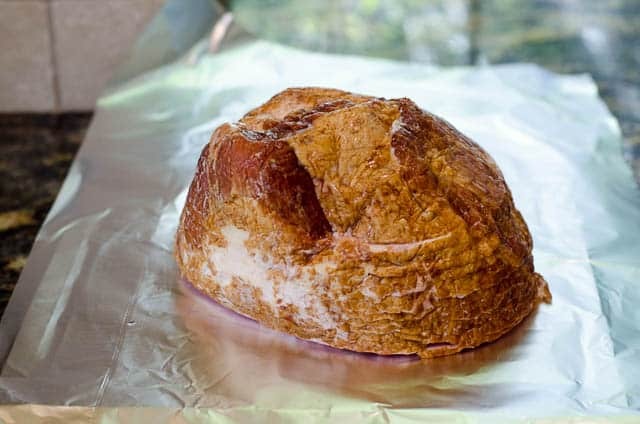 Carefully peel back the foil, creating a foil bed for the ham, and pour the glaze over the top. 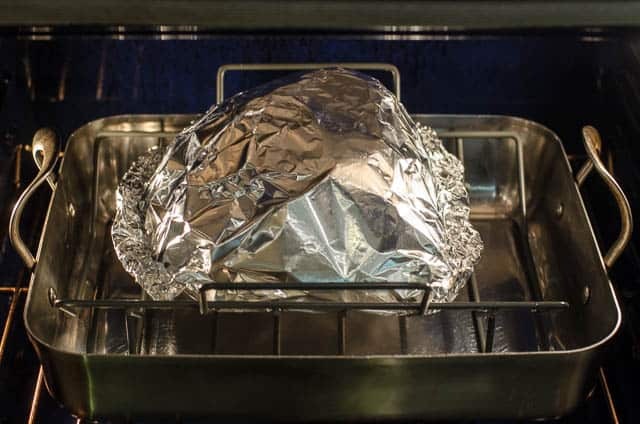 The foil bed prevents the glaze from heading to the bottom of the roasting pan and gives us another opportunity to spoon it over the top. Our happy glazed ham is ready for another quick visit to the oven. It will need about 15 minutes or so in the hot 400 degree oven to caramelize the glaze. And, that is all there is to it! Spoon some of the glaze infused cooking liquid that has been captured in the foil over the top and let the ham sit for about 10 minutes. Then transfer it to a cutting board to slice and serve. 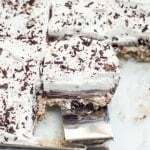 It will slice up easily and beautifully in a manner of minutes and you can get on with your holiday meal. 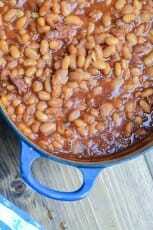 Wrap up and refrigerate that meaty ham bone and make a pot of Baked Beans from Scratch. It’s pretty much guaranteed that this is going to go over well with your guests. It’s classic. And, I think the best part may be that you’ll have luscious ham leftovers waiting for you the next day. I want to wish you all a wonderful and delicious Easter and the best of luck with all of your holiday kitchen endeavors! 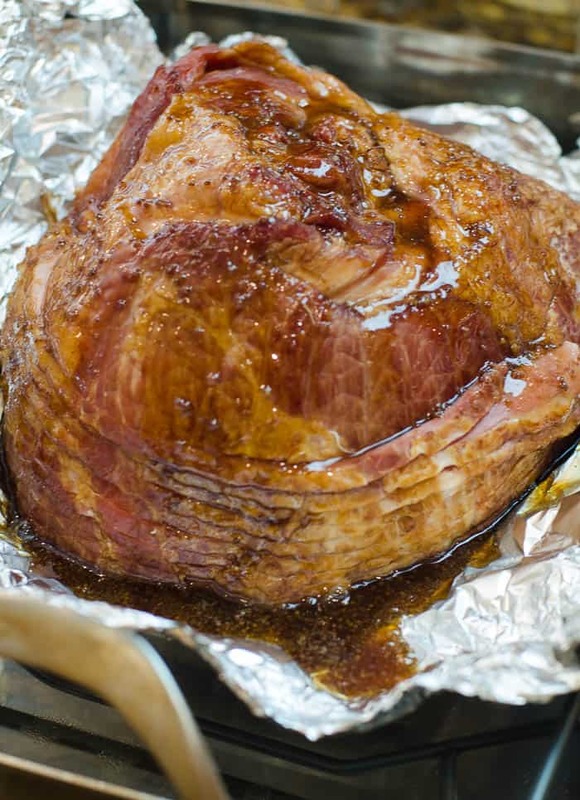 A homemade spiral ham with a delicious maple glaze that rivals any store-bought variety. 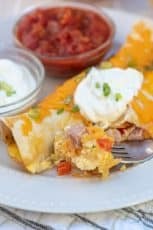 Save yourself some money and make it at home! 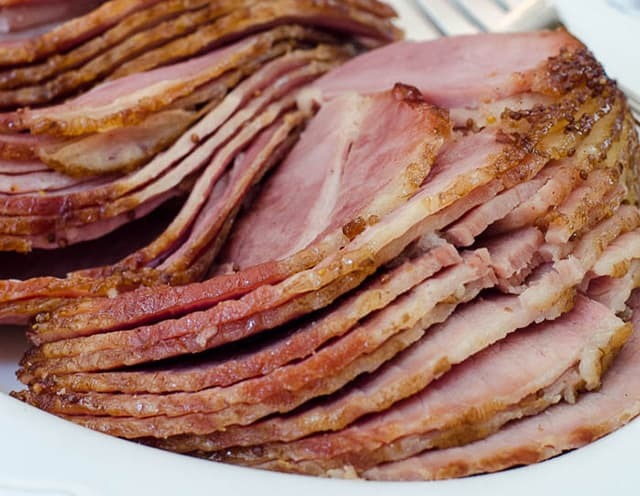 Remove ham from packaging and enclose, cut side down, securely in a large piece of heavy duty foil. Close the foil so that it will open from the top. Place on a rack in a large roasting pan. 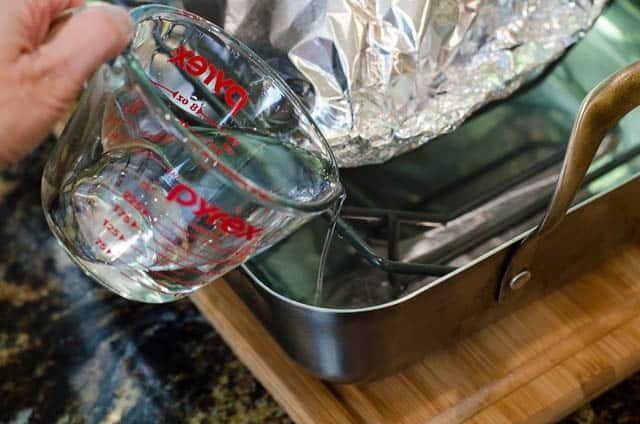 Pour about 1" of water into the bottom of the roasting pan and place the pan in the preheated oven. Bake for 10 minutes per pound until heated through. For a 7 to 9 pound ham the cooking time will range from 70 to 90 minutes. Check periodically and add more water to pan if it cooks off. 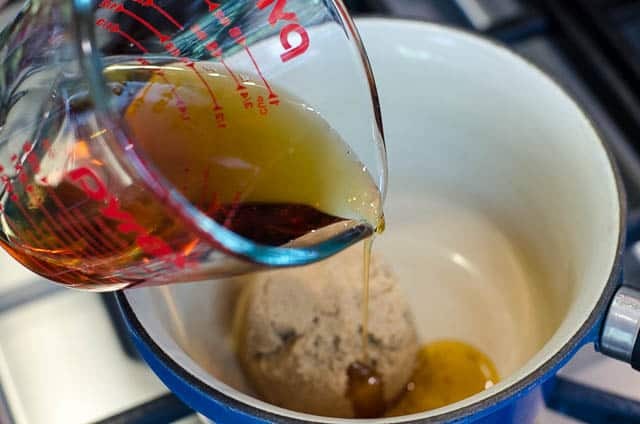 Meanwhile, whisk together glaze ingredients in a saucepan over medium heat. Allow to simmer for a couple of minutes, then remove from the heat and set aside. After cooking time, remove pan from oven and increase oven temperature to 400 degrees. 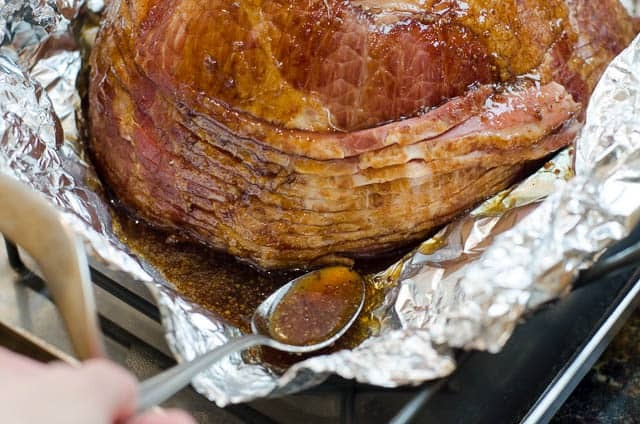 Open foil to expose ham and pour glaze evenly over the top. Return the pan to oven for an additional 15 to 20 minutes, or just until glaze has caramelized. Remove from oven and allow to sit for 10 minutes before slicing and serving. Spoon the cooking liquid that has been captured in the foil over the ham as it rests. Those Kirkland hams are the best, ain’t they? Gonna try your glaze/cooking method on the next one. Then it’s ham sammiches, ham/potato casserole, bean and ham soup, ham and’ eggs, curried ham for days! Yes, that’s right – 325 degrees. Thank you for posting this! It is very helpful for a new bee and I truly appreciate the time you spent posting this! Many blessings your way! 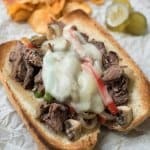 This is an excellent recipe. Thank you very much. I fixed our spiral sliced ham this way today. Oh my! It was the BEST ham I have ever had! YUMMO! Thank you! Made this tonight. My mother said it was the best ham she ever tasted! I used a Trader Joe’s uncured ham. Oh, don’t you just love that? I’m so happy the recipe worked out so well for you and thanks for the tip on the TJ’s ham. I’ll check those out next time I’m over there. 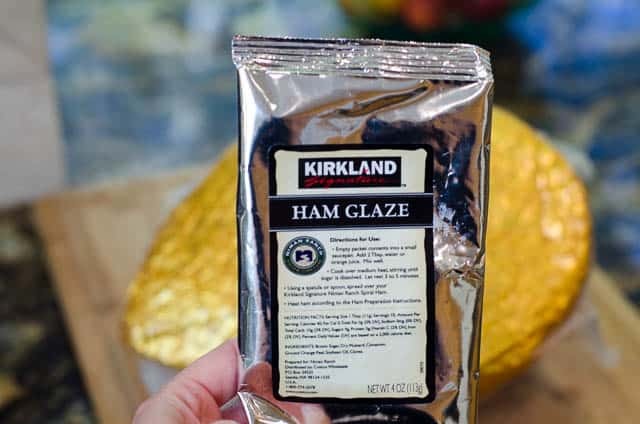 Appreciate your glaze and preparation instructions but I will never buy a Kirkland’s ham again. It was terribly fatty. A couple of people had told me they were good hams but never again. I’ve had such good luck with the Kirkland hams. I’m so sorry you had a bad experience, Robin! I buy one every year and have they’ve all been excellent. 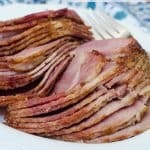 Do you have any gravy recipes that would acompany the spiral cut ham? Hi Michelle. 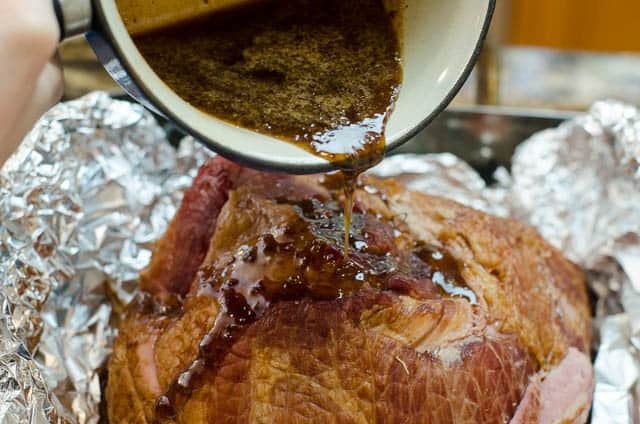 I do a pineapple sauce that we love but that is the only type of sauce or gravy I’ve done with ham. You can find it HERE. Can this be cooked a day before needed and reheated? If so, at what temperature and for how long? Hi Alexis. 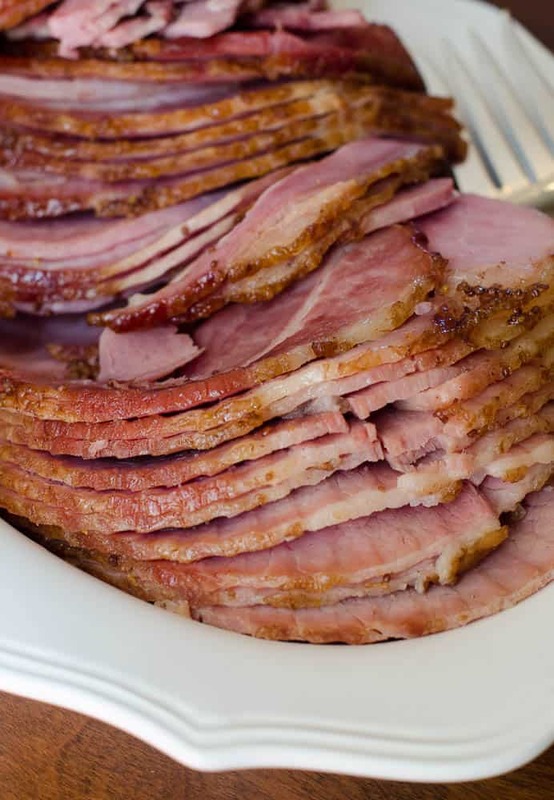 A spiral sliced ham comes to you fully-cooked so heating it up twice may dry it out a bit. For the best result, I’d recommend cooking it just before you want to serve it, unless you want to serve it cold. If you want to get some of the prep out of the way you could prepare the glaze and refrigerate it overnight. 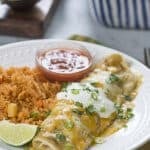 Am I right that the water is to put in the pan and not part of the glaze recipe? Merry Christmas! Hi Jeff. Yes, you are right. The water goes in the pan. Merry Christmas to you! 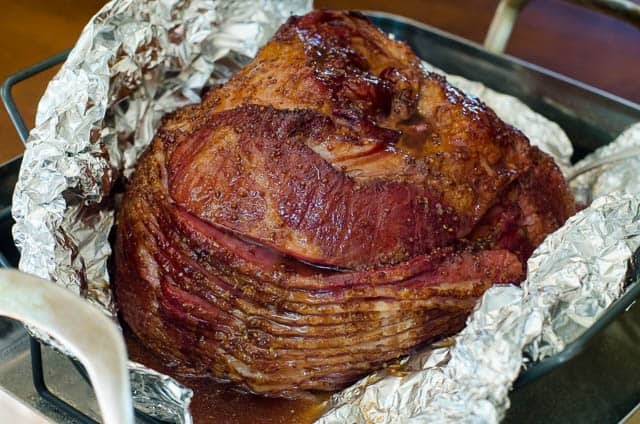 We made this delicious ham from Costco for Christmas. It was a hit, and your recipe and reheating instructions were superb! Very practical and easy to follow. Thank you and Happy New Year to all! AK from Texas!